So I had this can of dulce de leche for a while. And I love dulche de leche, but never cook with it. And I seriously considered making my own for this recipe since I had condensed milk home too. But is it really necessary? Sometimes it is OK to let life make it a little bit easier. I will make my own some other time, promise. I used recipe from Dorie Greenspan's Baking From My Home To Yours, this time I did it in a 8 inch spring form pan and made it little more thicker, I wanted it a bit more "doughy", you can make it thinner or thicker, depending what you like. Put the flour, confectioners' sugar and salt in the work-bowl of a food processor and pulse a couple of times to combine. Scatter the pieces of butter over the dry ingredients and pulse until the butter is cut in coarsely - you'll have pieces the size of oatmeal flakes and pea-size pieces and that's just fine. Stir the egg, just to break it up, and add it a little at a time, pulsing after each addition. When the egg is in, process in long pulses - about 10 seconds each - until the dough, which will look granular soon after the egg is added, forms clumps and curds. Just before your reaches this clumpy stage, the sound of the machine working the dough will change - heads up. Turn the dough out onto a work surface. Very lightly and sparingly - make that very, very lightly and sparingly - knead the dough just to incorporate any dry ingredients that might have escaped mixing. Butter the tart pan and press the dough evenly along the bottom and up the sides of the pan. Don't be stingy - you want a crust with a little heft because you want to be able to both taste and feel it. Also, don't be too heavy-handed - you want to press the crust in so that the pieces cling to one another and knit together when baked, but you don't want to press so hard that the crust loses its crumbly 'shortbreadish' texture. Freeze the crust for at least 30 minutes, preferably longer, before baking. To partially bake the crust (for this recipe): Center a rack in the oven and preheat the oven to 375 degrees F. Butter the shiny side of a piece of aluminum foil and fit the foil tightly against the crust. Bake the crust 15 minutes, then carefully remove the foil. If the crust has puffed, press it down gently with the back of a spoon. Bake for another 3 to 5 minutes, then transfer the crust to a cooling rack; keep it in its pan. Blend sugar with egg yolks and then add the vanilla extract, flour and half of the milk. Blend. Bring the other half of the milk to a boil and then add to the egg yolk mix. Put everything into a heat proof bowl over a boiling pot of water and mix constantly until it thickens like a pudding. Remove from the heat and mix in the butter, until combined. 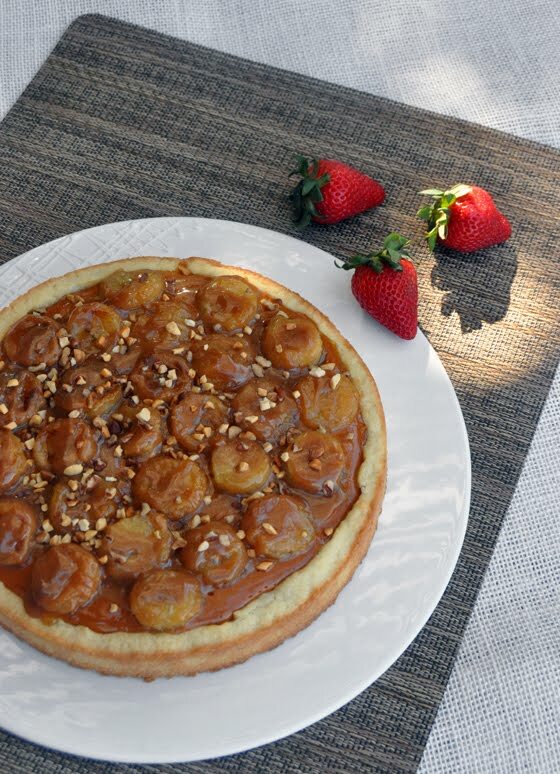 Pour in the tart shell making sure you leave enough room for sliced bananas and dulce de leche. 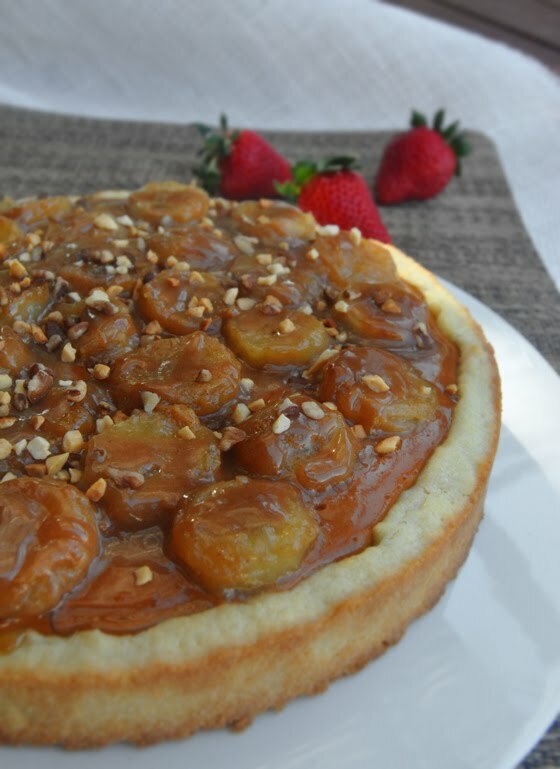 Arrange sliced bananas on top and pour some dulce de leche over the bananas. Bake for 20 to 30 minutes on 375 until dulce de leche is starting to caramelize. Sprinkle with some nuts, I used chopped hazelnuts. Hope you enjoy this! Warning, it is pretty sweet....but if you like dulce de leche, you already know this! I put some whipped cream on top too! Looks sooooo sweet and delicous!